From our official website we would like to offer our sincerest thanks to TodoRacing. It was a nice experience to be interviewed n your magazine in the issue of 2016´s July-August. 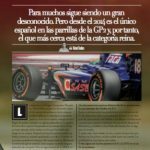 In the interview, Sergio reveals plans for his future projects and his current season in the GP2 Series and how difficult the main F.1 feeder series is. Sergio has never shied away from his positive attitude, enthusiasm and perseverance.